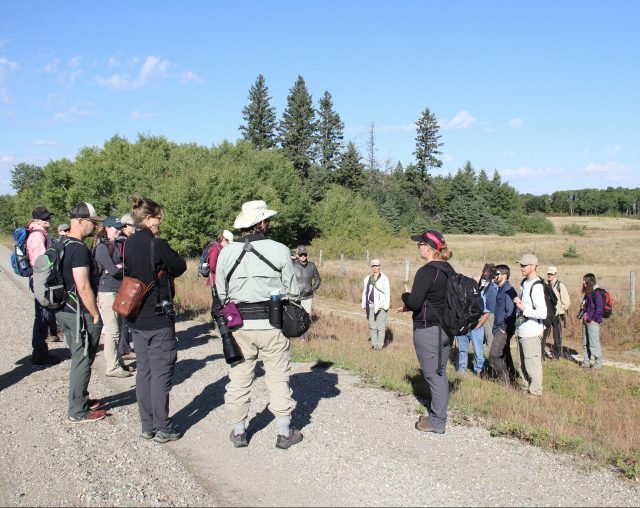 Dr. Pamela Rutherford, wearing a black jacket, black hat and black backpack, leads a field trip to Sprucewoods Provincial Park during the 2017 Canadian Herpetological Society Annual Conference. BRANDON, Man. – Dr. Pamela Rutherford got more than she expected out of the Canadian Herpetological Society (CHS) Annual Conference, held this month at Brandon University (BU). 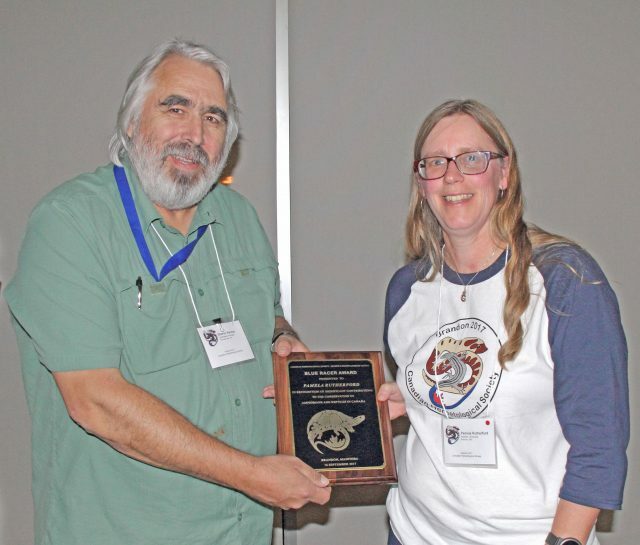 Steve Hecnar, left, of the Canadian Herpetological Society, presents the Blue Racer Award to Pamela Rutherford. Rutherford, the Chair of BU’s Department of Biology, was also the recipient of the prestigious Blue Racer Award. Named after an endangered type of snake, the Blue Racer Award is presented annually to an individual in recognition of cumulative contributions to the conservation of amphibians and reptiles in Canada. A maximum of one Blue Racer Award is given out each year. “It was quite an honour and a surprise to be recognized by the Society in this way,” said Rutherford, whose research includes determining the effects of habitat fragmentation and habitat loss on amphibians and reptiles. Rutherford was also an organizer of the conference, which drew about 70 researchers, students and other people interested in herpetology, the study of amphibians and reptiles, to Brandon. Their activities included a field trip to see the unique plants and animals of the Spirit Sands in Spruce Woods Provincial Park.